Army Commander Lieutenant General Lionel Balagalle with Defence Ministry approval on Friday stripped the commissioning ranks of two Army officers and ordered the premature retirement of another senior Army officer for their alleged connections with the Athurugiriya Safe House raid. The Army Commander also ordered Department level disciplinary action against two soldiers for their alleged connections with the Safe House raid, Army sources said yesterday. Defence Secretary Cyril Herath told the Daily News that the Ministry approval was given to Lt. General Balagalle to take disciplinary action against the three officers. He said President Chandrika Bandaranaike Kumaratunga in her capacity as the Defence Minister approved this action following the recommendation by the one man Presidential Commission headed by retired Appeal Court Judge D. Jayawickrema to probe the Athurugiriya Safe House raid. "The disciplinary action is also based on the recommendations by the Army Commander to the President," he added. Disciplinary action against another set of officials are to be announced in the coming days, sources added. Major General Ivan Dassanayake, Adjutant General of the Sri Lanka Army was the most senior officer subjected to disciplinary action. The Army Commander has ordered General Dassanayake, the Provost Marshal of the Army at the time of the Safe House raid, a pre-mature retirement from March 31, 2004. He has been ordered pre-mature retirement on the charges for not informing the Army Commander about the raid. Major General Dassanayake can remain in the Sri Lanka Army until June 30 this year when his extension expires. Colonel Parakrama Dissanayake, the Deputy Commandant of the Army Training Centre Diyatalawa and Major Najith Karunaratne, Head of Military Intelligence in Jaffna have been relegated to civilian status from January 30, 2004 after being stripped of their commissioned ranks in the Army. "All military installations will be out of bounds to them from January 31," Army sources added. Colonel Dissanayake was the former Commanding Officer of the Military Intelligence Corps and a staff officer at the Directorate of Military Intelligence at the time of the Safe House raid. The officers have been charged for attempting to obtain the Safe House address. 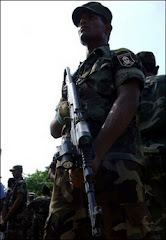 The raid of the safe house at Millennium City, Athurugiriya on January 2, 2002, had serious repercussions on the Army intelligence units specially those involved in the Long Range Reconnaissance Patrol operations in the North-East. Police raided the Army Safe House on January 2, 2002 in the guise of arresting few army deserters for their alleged involvement in the Udathalawinna massacre. The Presidential Commission ruled in its findings that the raid on the House was a betrayal and absolute treachery on the nation. "The existence of the Safe House operated by the Sri Lanka Army at No. 844 Millennium City, Athurugiriya is beyond any doubt. Except a retired Lieutenant Colonel, Jayavi Fernando, all other witnesses including the Army Commander and other officers, the Inspector General of Police and the other senior Police Officers who gave evidence as witnesses before this Commission accepted that this was a legally maintained Safe House by the Sri Lanka Army. Even Jayavi Fernando expressed the view that there was an Army sub-unit at this house and that it was not a safe house. "There is strong evidence that Col. D. P. Dissanayake, USP psc, made attempts to obtain the address of this Safe House before the 2001 December General Election, and also just a few days before the raid through Major M. B. de S. Jayatilleke, RSP MIC - GSO 1 DMI, and Corp. M.P. Anura Peiris, MPA MIC. The evidence of these officers themselves proves this fact. "Knowing Capt. Nilam very well there was no necessity for Col. D. P. Dissanayake to find out the address and the whereabouts of Nilam through his junior officers. If we wanted he could have directly contacted Capt. Nilam and got whatever information he wanted. Col. Dissanayake's explanation was that he wanted to contact Capt. Nilam to get his assistance in respect of the house Col. Dissanayake was building at Malabe. "The evidence before this Commission further discloses the fact that Lt. Col. Padmasiri Udugampola, SLCMP, brother of ASP Kulasiri Udugampola, Major General Ivan Dassanayake and Colonel K.H.N.S.S. Dharmaratna, Major A.C.A. de Soysa, SLCMP, Major A.S.P. Podiralahamy, SLCMP, Major K.U. Jayanetti, SLCMP, Major B.M.A.N.S.K. Karunaratne MIC Corps, J.H.A.P. de Silva, JHAT-MIC, Corp. M.P.A. Peiris, JHAT-MIC were all aware of the impending raid and have directly and indirectly assisted Kulasiri Udugampola in raiding this Safe House. "If these officers had any doubts about the Safe House they should have brought it to the notice of the Army Commander and moved the Military Police to investigate. But these officers, without doing so, have conspired with Kulasiri Udugampola to raid this Safe House for their own personal benefits. Moreover, none of these officers have informed the Army Commander or the Director, DMI, about the raid before the raid."